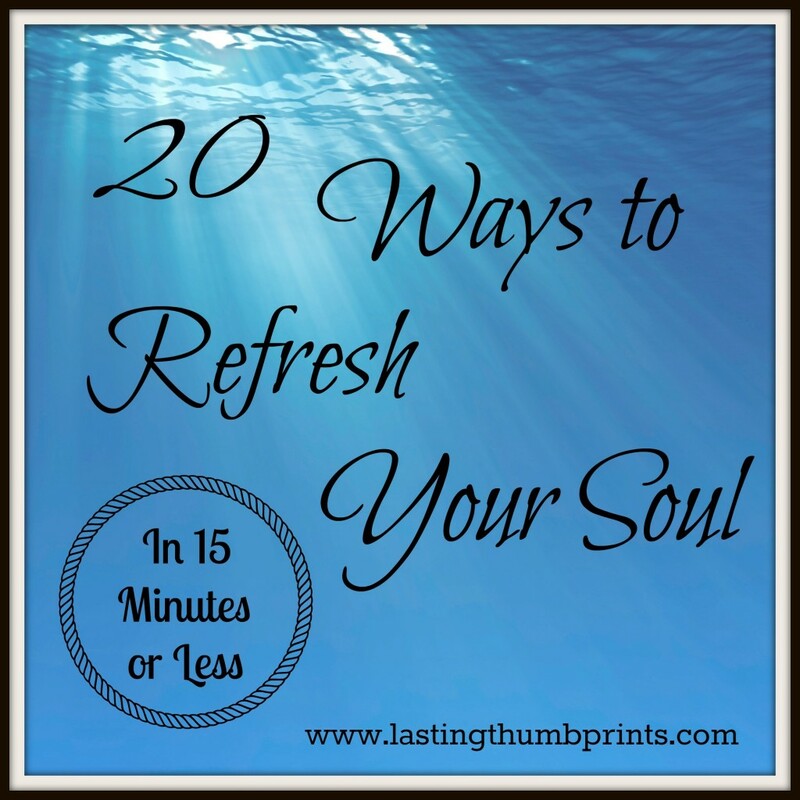 Earlier this week I shared the first half of twenty ways I refresh my soul in 15 minutes or less. Today we’re going to finish up that list, but first I’d like to share my heart a bit. We are each unique beings, which is wonderful! I know that the ideas that I’m sharing won’t work for everyone, but it’s my hope that it might inspire you to discover small ways to care for yourself throughout the day. Fifteen minutes is not a long time and it really is okay for us to spend (at least) that much time tending to our well being. Just like a car without fuel will not run, we cannot run on empty. We cannot pour out anything into our families if we are empty. These ideas are not meant to be a substitute for personal time with God. True refreshment can be found in Him. He is the one who satisfies my soul. Saying that, I do think He wants us to enjoy the world He has put us in and the lives He has given us. It’s okay to have fun. It’s okay to take pleasure in the things around us. Now, how about getting back to that list, eh? I believe the ability and gift to create is inherent in all of us. It manifests itself in many different forms. Do you love flowers & like to bring them inside? Do you play an instrument? Like to cook? Write? You could color a picture or doodle with your children. Spend some time soothing your soul by making something. Maybe tea isn’t your thing, but grab a cup of your favorite warm beverage and let yourself sit and enjoy it. I recommend avoiding caffeine for this if at all possible. If it’s hot, have iced tea or a glass of cold lemonade to refresh you. Sometimes just simply turning off any electronics that are not being used can make me immediately feel better. The low humming, the whirring noises, they all build up for me. Stop and listen to see if there is extra noise in your home that doesn’t really need to be there. As an added benefit, you can save some electricity! Try deep breathing for a few minutes. It helps clear your mind and relaxes your body. This one only works for me if I’m by myself. I need quiet or some soft music. Take a few minutes to do something that will bless someone else. What small thing can you do that you know will bring joy to another. Write an encouraging note to a friend. Send a quick text to your spouse letting them know how much you appreciate them. Make a special treat for your child. Go outside and walk around your yard or down the street. Get your body moving! And no, cleaning up messes and chasing children doesn’t count. 🙂 A change of scenery can be really good at times. Laughter, it’s medicine for the soul. Be silly with your kids. Think of the funny things or stories you’ve heard recently. Make up a song. Dance like you don’t care. Play a fun game. Whatever makes you smile, just do it and lighten up! We talked about blessing someone else, but you count also! Do something that makes you feel good. Paint your toes. Wear something colorful. Put something pretty in your hair. Get out your favorite lotion and put it on. Take a few minutes to pamper yourself. Have you allowed “stinking thinking” to take over your thoughts? Our thought patterns can take a heavy toll on our souls and well being. Be honest with yourself and evaluate your attitude toward life. If you know you’ve allowed negative and false thoughts to invade your soul, ask for God’s forgiveness and help. He’s ready and willing! I find it especially helpful to have a scripture or two memorized for battling this. I know this may sound totally unrelated to taking care of your soul, but hear me out. Hydration is important not just for the body, but the mind. It effects the way we think and our clarity. I can feel a significant difference in my frame of mind when I have not had enough to drink. Keep hydrated! I personally still need time alone and away from the house, but these ideas help me until I can find that time. What are some ways that you keep yourself refreshed when you don’t have a lot of time? Thank you so very much. I was Inspired in several areas as I read and took notes. I actually stopped within the reading and moved in doing some of what I heard to personally do in connection to your suggestions. Being that I too would enjoy passing on Encouragement that is God Inspired with real life applications I’m hoping that one thing I would create would be a way to do a similar thing as this. This refreshing article has made a lasting print. Thank You again.